Doctors can now study highly accurate 3D models of a patient’s musculoskeletal system. These 3D reproductions help medical specialists diagnose ailments, plan for surgery, provide education to the patient, and more. Based in Belfast, United Kingdom, Axial3D uses a patient’s unique CT and MRI scans to create an exact replica as a 3D printed model. Axial3D’s clients span the public and private healthcare sectors in disciplines that include orthopedics, oncology, oral and maxillofacial, trauma, and transplant surgery. Founder Daniel Crawford’s goal is to provide the healthcare sector with custom medical models that improve the experience of both doctors and patients. He explains, “Every bespoke print from Axial3D offers surgeons unprecedented insight beyond conventional 2D patient scan data and, in turn, will elevate patient care across a wide spectrum of disciplines.” Custom 3D modeling is transforming every step of the doctor-patient interaction. Watch to webinar, where Katie McKinley, strategic partnerships at axial3D, and Gaurav Manchanda, director of healthcare at Formlabs, will walk through a case study on using axial3D and the Form 2 printer to produce a model for a spinal surgery, along with other examples across cardiac, trauma, orthopedics, and oncology. Axial3D founder Daniel Crawford (left) and co-founder Mark Stewart (right) create medical models that help doctors diagnose ailments more accurately. Custom medical models are 3D reproductions of CT and MRI scans, making them highly accurate and specific to each patient. These 3D prints give doctors more information than what’s possible in a 2D representation of a patient’s anatomy. Daniel explains, “Having access to a patient’s full-scale anatomical model, whether it be a heart or a pelvis, has allowed surgeons to more accurately diagnose and determine treatment for that patient and in some cases completely change the course of treatment with the additional information given from the prints.” Specialists can inspect a full scale model of the anatomy in three dimensions, giving them unprecedented insight into a patient’s needs. It’s essential that these models are highly accurate, so Axial3D produces their models with in-house 3D printing to capture each scan's intricate details. Having access to a patient’s full-scale anatomical model has allowed surgeons to more accurately diagnose and determine treatment for that patient. Custom medical models help doctors decide on the best treatment method based on a patient’s personal anatomy. After diagnosis, specialists use the models to determine the best treatment. A high-resolution 3D model gives doctors a more holistic view than the conventional 2D realm of radiography. Daniel says, “Having access to a tangible, scale model of what is inside the patient allows surgeons to visualize and explore the ailment or injury in real space and reach a much more comprehensive understanding of their patient’s injuries and to determine the optimal treatment for each diagnosis.” For example, Axial3D uses cancer patient scan data to produce bespoke liver models that surgeons use to decide whether to remove a tumor or perform chemotherapy. 3D models make a huge difference. Surgeons use anatomical models to prepare equipment for operations, greatly reducing the risk of complications. Custom medical models help surgeons plan and practice for operations. Pre-operative planning not only cuts the time that patients spend in surgery, but it also reduces the risk of complications and infection rates. Patients spend less time in rehabilitation, saving a huge amount of hospital resources. Daniel says, “With our models, surgeons can trial new techniques and prepare equipment well in advance of stepping into the operating theatre. Less time in surgery greatly reduces the risk of complications, speeds recovery, and saves time and money.” Using 3D models for pre-operative planning benefits everyone involved. With our models, surgeons can trial new techniques and prepare equipment well in advance of stepping into the operating theatre. Less time in surgery greatly reduces the risk of complications, speeds recovery, and saves time and money. 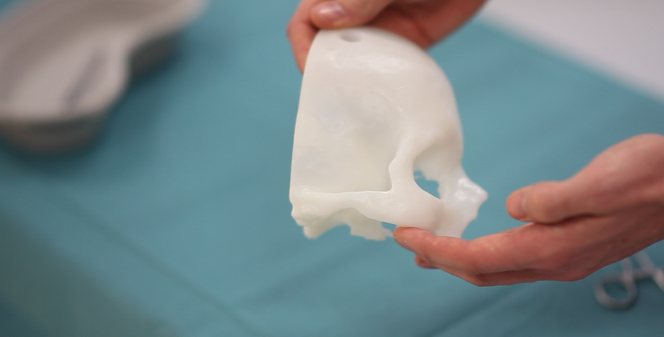 Axial3D uses in-house 3D printing to quickly create high-resolution medical models. Learn more about the impact of using patient-specific 3D printed models and other 3D printing healthcare applications. Want to see the SLA quality firsthand? Explore the materials and request a free sample.